Clustering is an incredibly powerful tool in the English classroom. It serves two main purposes: curing writer’s block and organizing thoughts to understand literature, plays, history, etc. Start in the box with the word “Clustering.” Clustering is a prewriting tool, and that tool leads to writing. Clustering causes writers to pay attention to any thoughts that pop into their heads about the original word. Thoughts come out as images and as ideas. The ideas often end up in an outline of what will be written. 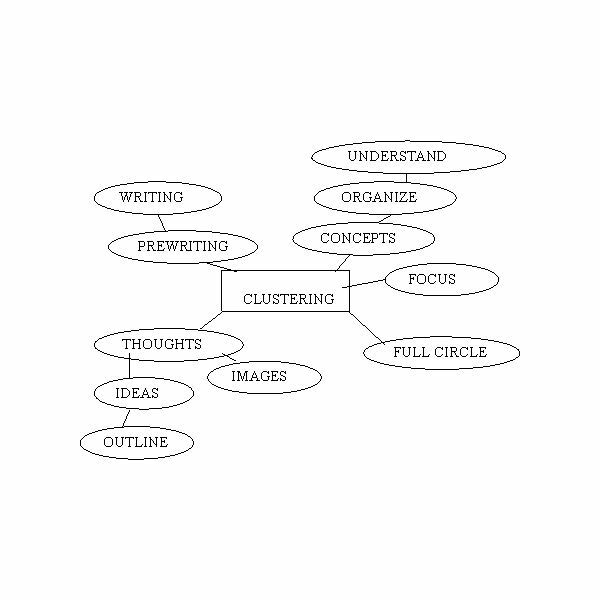 Clustering allows writers to focus. Clustering causes writers to come “full circle” with a concept, as they are readily able to write down everything associated with the word, including opposite viewpoints. Clustering helps writers break down concepts which makes those concepts easier to organize. Once information is organized it becomes easier to understand. Have your class cluster one word at a time. Use a separate piece of paper for each cluster so each time they begin they are looking at a blank slate. The fun begins when students share and discuss their individual clusters, as different students will likely embark on different tangents. Display clusters on the wall after the activity; this gives students the opportunity to compare the various tangents they came up with. Remember that words with more than one meaning will most likely bring up the most interesting results when shared. Once students are familiar with clustering, they can use it as a tool for any writing project.